Indigo is one of the oldest known natural dye used in ancient times to get natural blue extracted from Indigofera tinctoria plant leaves. 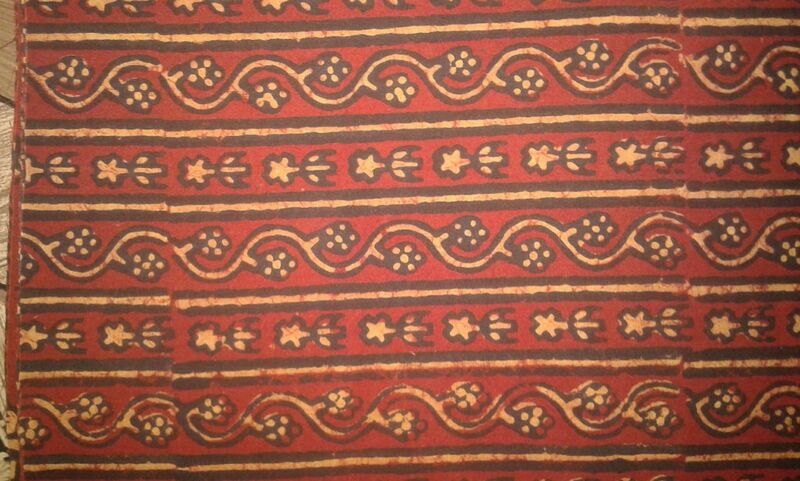 Indian subcontinent was famous for its cultivation and used in dyeing traditional block printed clothes. 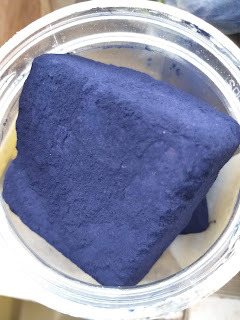 It was one of the early known natural dye used in cold form by fermenting the indigo leaves or powder extracted from leaves through as certain process. 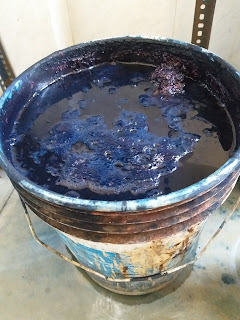 In today's time natural indigo is used by very few dyers in organic form. To prepare a vat or dye pot any plastic drum or underground cemented tank is used. Size of the indigo vat depends upon the use and demand. Traditionally a pitcher is used to prepare a indigo vat. There are 3 variants of Indigo color is available in the market today. By mixing all the natural and organic ingredients in water with indigo powder a natural indigo vat get prepared. Using all these natural and organic ingredients in preparing organic natural indigo vat requires 12 to 24 hours in activation. It also depends upon the weather and use of ingredients in proportion. 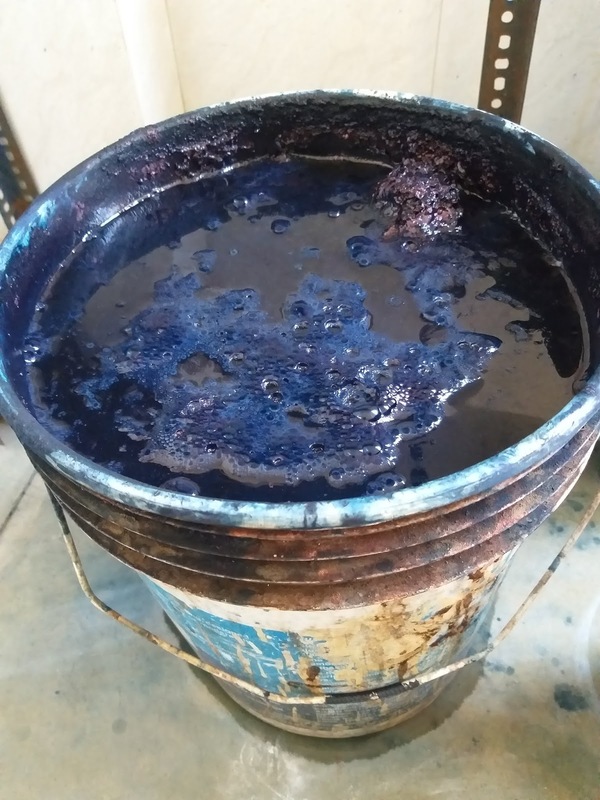 If some dyer is using synthetic chemical ingredients as a reducing agent in preparing natural indigo then it is of no use because the natural herbal properties of indigo got nullified while using heavy synthetic chemical based reducing agents in preparing the vat. Why people use synthetic chemical ingredients in natural indigo? Most of the indigo products available in the market are flooded with synthetic chemical indigo dyed products marketed as natural indigo dyed products. 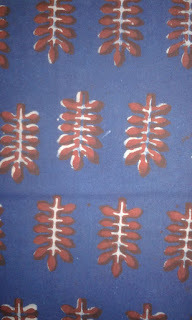 After introduction of synthetic version of indigo in the market every hand block printing cluster is using synthetic (chemical) indigo to dye the fabrics. Synthetic indigo vat get prepared using synthetic chemical ingredients only. 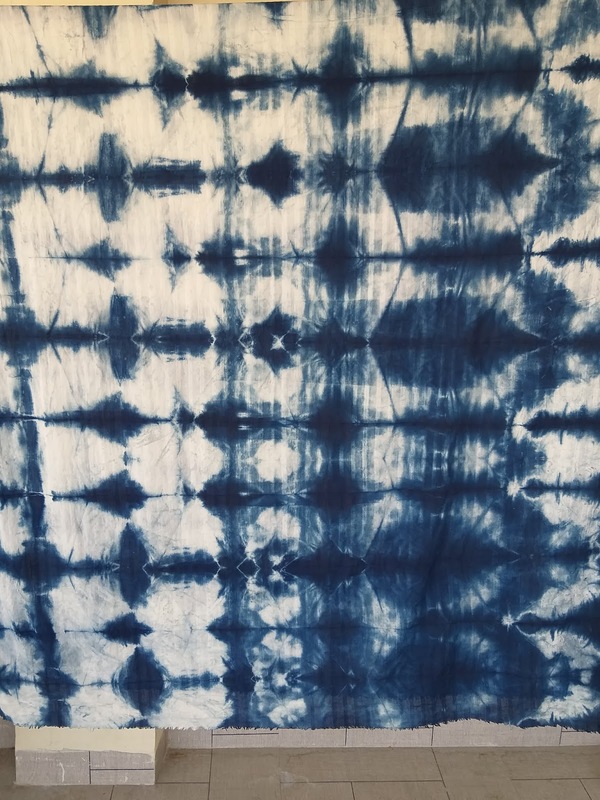 Why hand block printers or dyers use chemical indigo? Now the million dollar question is how to identify the difference in between synthetic chemical & natural indigo? It is not easy to identify the difference of shades in between organic natural, natural chemical and chemical indigo dyed fabrics initially. It all depends upon the level of honesty and transparency of block printer, dyer or marketing company to mention it. 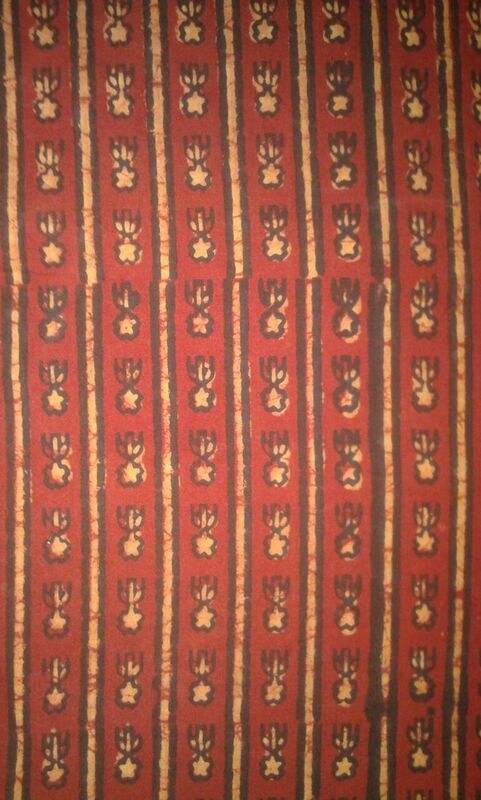 One of the most mystical colorful and oldest known technique of hand block printing is Ajrakh. We already discussed about the history and interesting story about Ajrakh in our previous blog "Ajrakh story" wrote more than an year ago. This blog will provide insight about two different school of thoughts based on the opinion of two different masters of Ajrakh on the evolution of Ajrakh. One modern thought developed in Gujarat about Ajrakh and another is from Barmer district of Rajasthan which stick to the old school of thought. On the basis of my study and meeting with two legends of Ajrakh hand block printing National Awardee Shri Ranamalji Khatri from Barmer & Dr. Ismailji Khatri from Ajrakhpur, Gujarat during my PhD., I am sharing different perspectives of Ajrakh as told by them. It is important in recent times to have a clarity about different school of thoughts about Ajrakh. One school of thought considers its Arabic meaning of Ajrakh as true other school of thought considers its literal meaning Ajrakh as a process. While talking to the Ranamalji Khatri about Ajrakh he told the story of Ajrakh that in ancient times some 2500 years when Arab tradesman from Mesopotamia of today's Iraq visited Sindh region and saw traditional hand block printing for the first time where geometrical patterns created on the fabric with penetration of indigo blue in the base they instantly said "Oh, ye to ajrakh hain" (Oh, this is blue sky). In Arabic language "Ajrakh" means blue or sky. Since then it is known as Ajrakh to the world. They stick to the Arabic meaning of Ajrakh as it is used for geometrical pattern printed with red, black and white and dyed background with indigo blue gives the feeling of blue sky. For other color background they have different names such as "Nashpal" for green background. This approach what I can call "Orthodox" or Old school of thought. In discussion with Dr. Ismailji Khatri; he considers "Ajrakh" as a process of doing hand block printing with a particular process of traditional importance and steps need to be followed. In his words Ajrakh means "Aaj hi rakh" (Keep it for a day), that means each and every step done in Ajrakh for a day only, one can not do next step of the process on the same day. One step need to be followed in a day only. So as per talk with the Dr. Ismailji Ajrakh is considered as a process with its literal meaning "Aaj hi rakh" (Keep it for a day). There is no restriction of color pattern without disturbing the traditional steps, use of natural color and process. I consider this thought as Open or Modern school of thought. 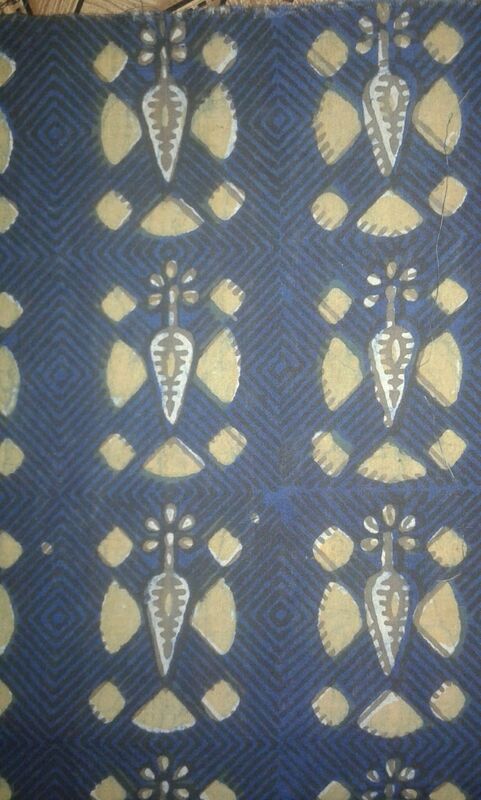 But still I think more and more research and interaction needed to explore hidden truths of this one of the oldest tradition of hand block printing. Ummedpura-Tarapur twin villages situated on the banks of "Maa" Gambhiri river in Neemuch district of Madhya Pradesh. 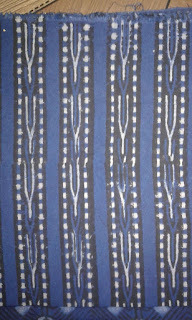 It is a twin village demarcated by a bridge made on the river were famous for its 400 years or even older than this craft of Nandana hand block printing practiced in these two villages only by traditional "Hindu Chippa" community belongs to the Sant Namdev tradition supported by "Muslim Nilger" community famous for indigo dyeing. Limited to tribal market, laborious process, limited design and color combination, and increasing cost of nandana print was the reason behind decrease in demand too. It was clearly an indication for them to do something new or stop the work. Many families stopped their traditional work of nandana 2 decades ago and started other business. Few families still continued their family tradition with concern for future of their tradition. While they were in dilemma to continue the craft or not few started searching for new markets and possibilities to innovate the existing techniques. In this time less than 10 families were left in this business who were practicing nandana hand block printing and sometimes other techniques of hand block printing. 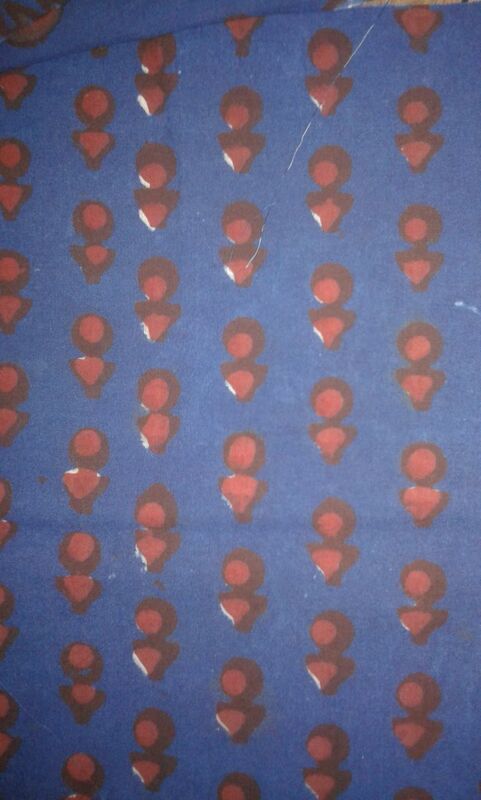 In this struggle period some 3 decades ago few exporters contacted hand block printer family of Late Shri Purushottamji Jhariya for indigo and different design combination in red and indigo color. Though they were doing it since ages but not commercially marketed well and it is how a new technique of block printing evolved. 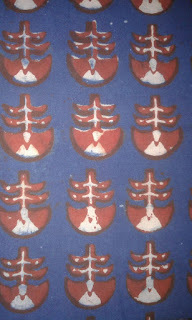 In this technique they started concentrating on use of alizarin print (red and black) combining with indigo Indigo dabu work to get a red. 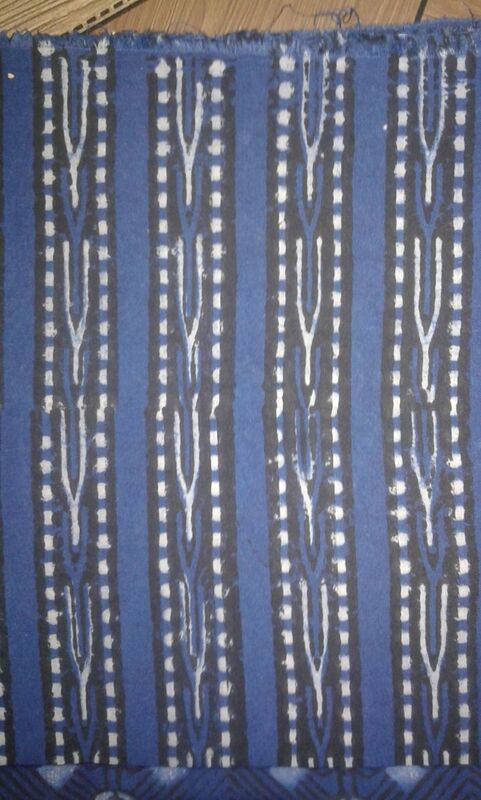 black and indigo blue color combination with variety of block designs. They started calling this technique as "Alizer-Indigo" technique to differentiate it. Tarapur as a craft village and home to a varieties of craft of hand block printing was facing an identity crisis. 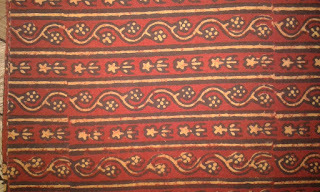 Bagh and Bagru villages were already famous for its unique alizarin hand block printing depicting their geographical identity. 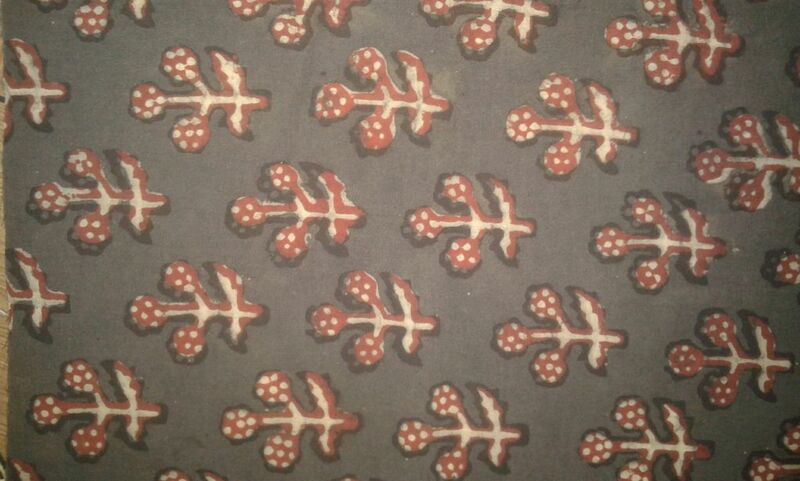 Then it was decided by Pushyamitra with Jhariya borthers (Pawan Jhariya & Banwari Jhariya) to market this unique combination of alizarin print and dabu print as "Tarapur Print" in the market. 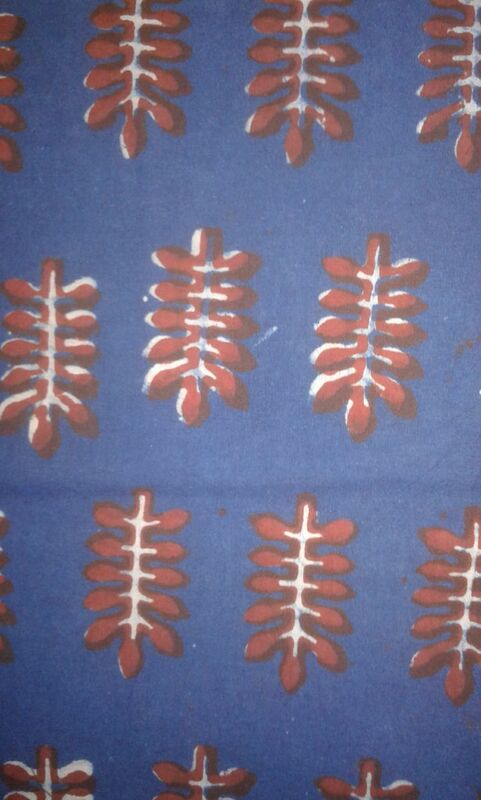 It is how name of Tarapur print came into existence. 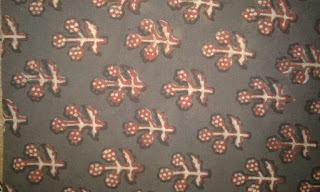 Today Tarapur print evolved as an important hand block printing technique and quite famous among craft lovers. 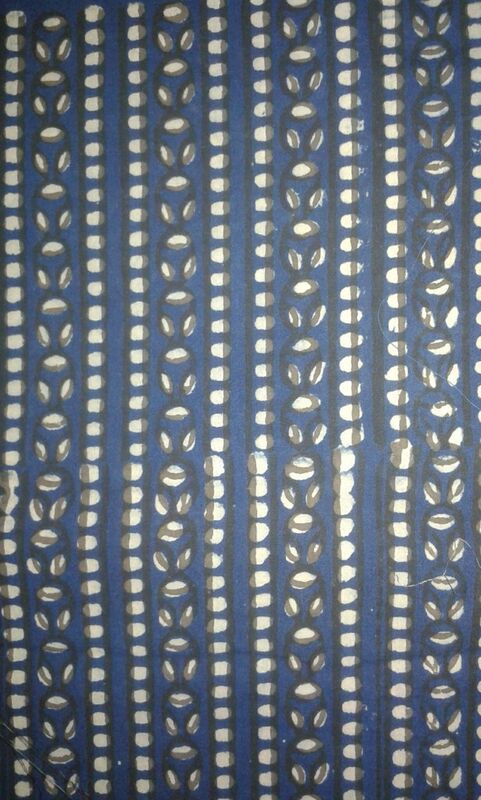 Process of Tarapur print is time consuming and laborious too as it is a combination of two different hand block printing known as Alizarin printing and Dabu printing. Fabric is first treated with a solution of soda ash, castor oil and sea salt now a days a ready combination known as TRO (turkey red oil) is available in the market is used. 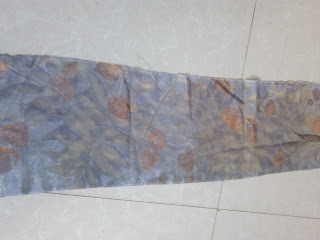 After this pre washing treatment fabric is dyed with harda (myrabalan) solution then it is ready for printing with alum mordant and paste made of iron rust and jaggery solution mixed with tamarind seed powder. After printing it is kept for 2-3 days then washed in flowing river or in tank then it is dyed with alizarin using bhatti (boiling) process. 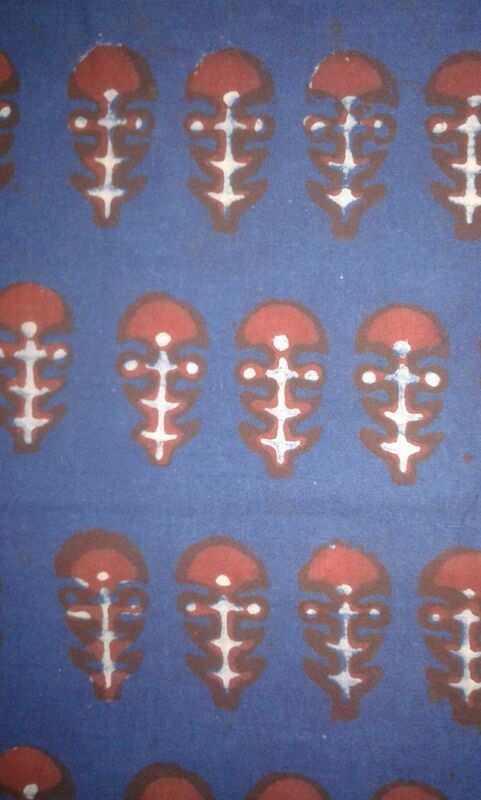 After bhatti process fabric again printed with resist paste made from clay, gum and lime to hide red portion and where we need white design in base now fabric is dyed with indigo an kept for a day. 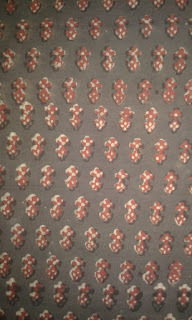 After washing and post mordant fabric is ready to market. 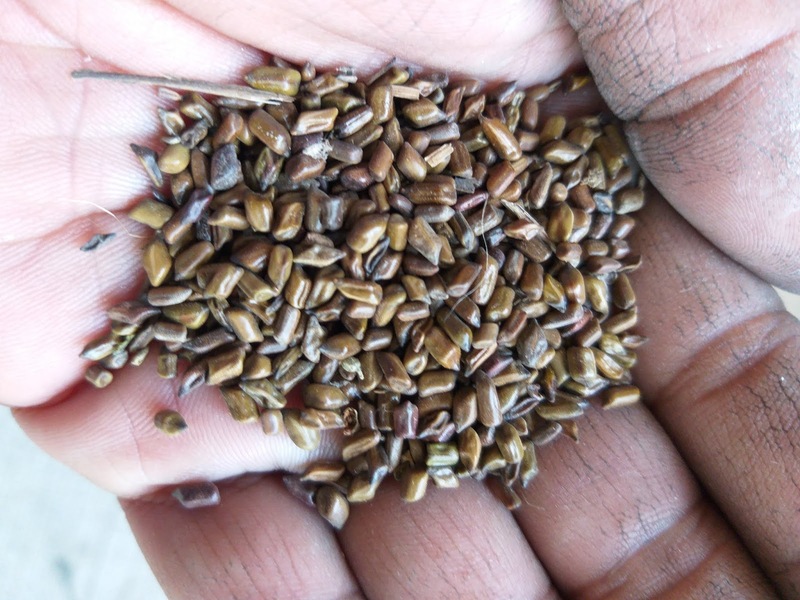 Jawariya means jowar ka dana (Sorghum or cereal grass) is a very old and traditional design used in hand block printing inspired from the nature. Once it was a trademark design of tribal people of Jhabua, Bagh, Neemuch, Ratlam and neaby places in Madhya Pradesh. In tribal Jawariya lugda (used as a Saree) is considered necessary during marriage. 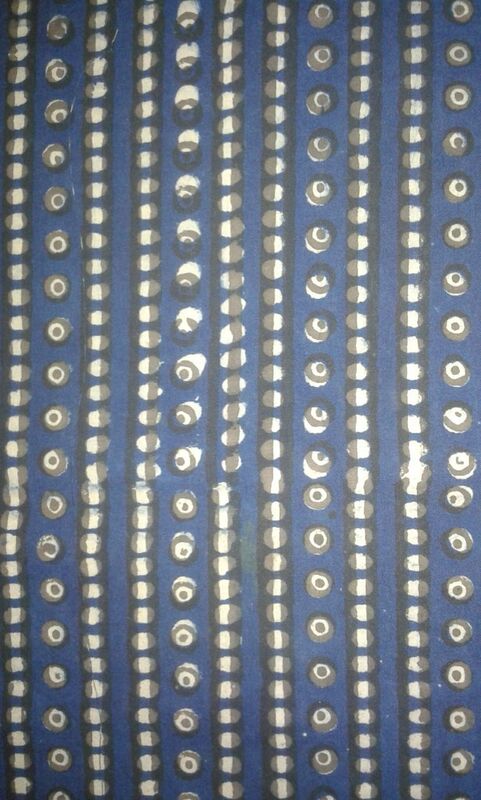 Without Jawariya lugda a kind of tribal saree no marriage ceremony considered completed among tribal even today. 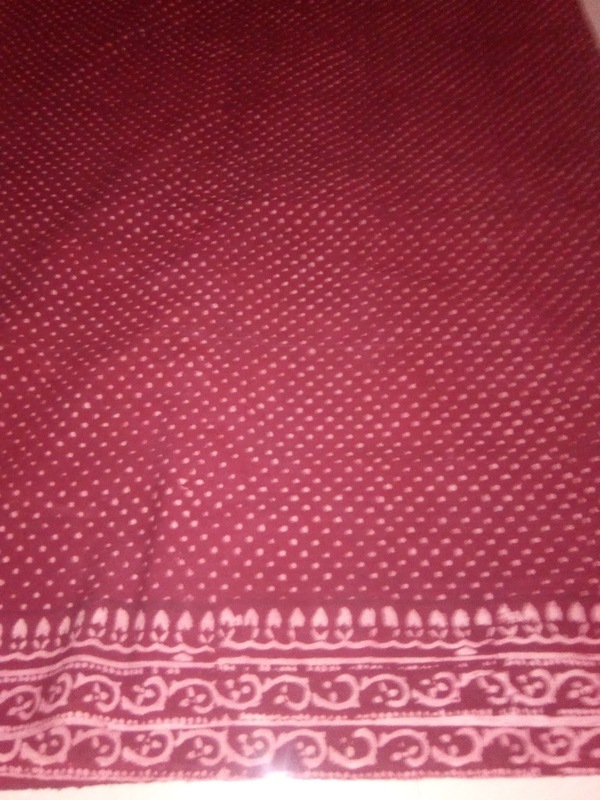 A thick cotton fabric like poplin cotton of 58 inches width and 2.6 meter in length is used by tribal bride as a short saree. 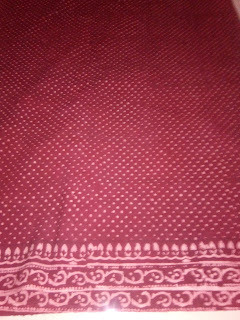 Fabric is hand block printed with alum using "Jawariya" design then dyed with alizarin to get complete red color and then dyed with loose pink color. 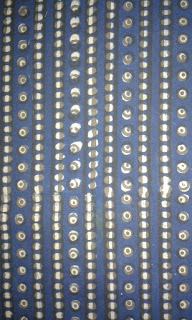 This Jawariya lugda is used by tribal bride as a Saree which is a must during marriage ceremony by wrapping it around the body. 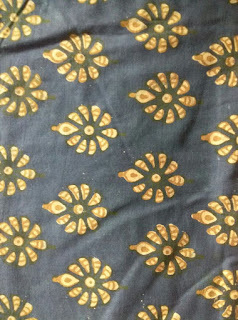 For urban people it is like a thick cotton material to make a kurta. EcoFab has done some changes in the color combination in this traditional "Jawariya" to make it a wearable art. A combination of red with iron black (Black color made from iron rust and jaggery powder), complete black combination. 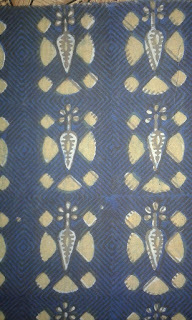 Traditionally "Jawariya" design was used by craftsman of various hand block printing centers in India including Madhya Pradesh and Rajasthan. In Madhya Pradesh it was printed in Bagh village and Tarapur village to fulfill the demand of tribal but today this design is equally liked and appreciated by urban customers. 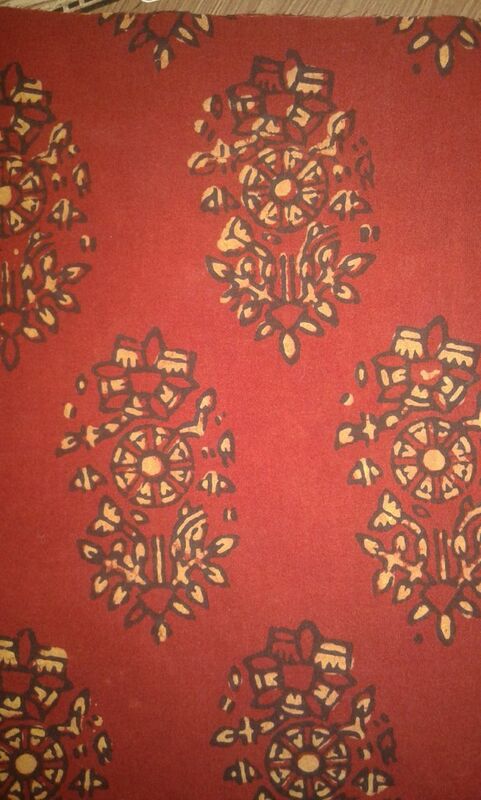 This design and tradition of printing lugda is continued by Jhariya family from Tarapur village in Madhya Pradesh. Madder or Manjishta (मंजिष्ठ) in Hindi is one of the oldest known sources of natural red color in dyeing fabrics worldwide. 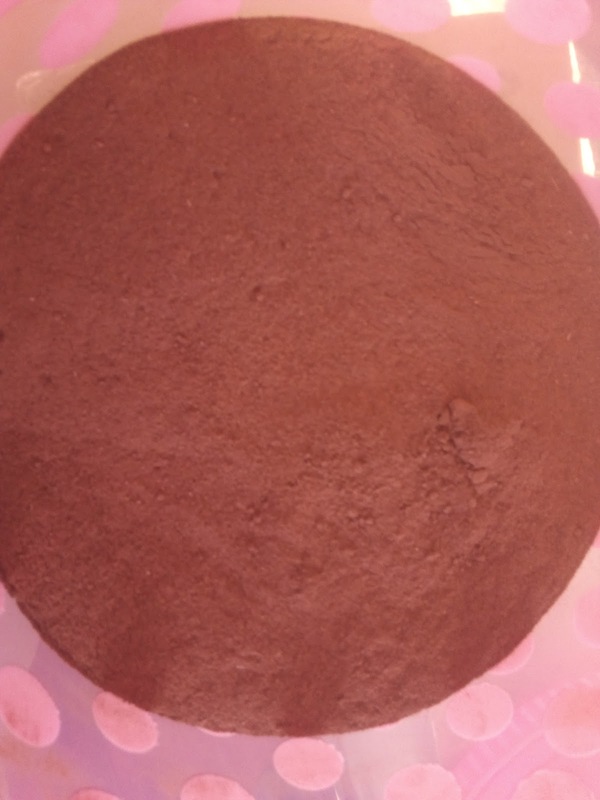 Roots of madder is used as a rich source of red dye since ages. It is found that even 3000 years B.C. in Mohen-Jo-Daro civilization it was used for dyeing clothes. 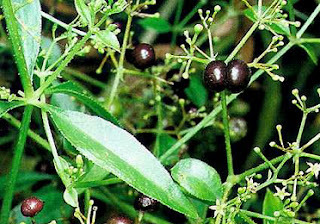 There are two different species of madder found in the nature, rubia tinctoria and rubia cordifolia. Rubia cordifolia is better known as Indian madder or common madder and rubia tinctoria is known as dyer's madder. Both the varieties are rich sources of purpurin and alizarin which gives shades of pink, red and orange with different mordants. Either madder roots or its powder is boiled in water to extract the dye stuff and then fabric dyed with it. Madder is one of the most useful natural dye used worldwide as source for variants of red. It is very fast dye if mordant is used properly. In past in India madder roots and al roots (morinda tinctoria) were used as a source of red dye in hand block printing industry. 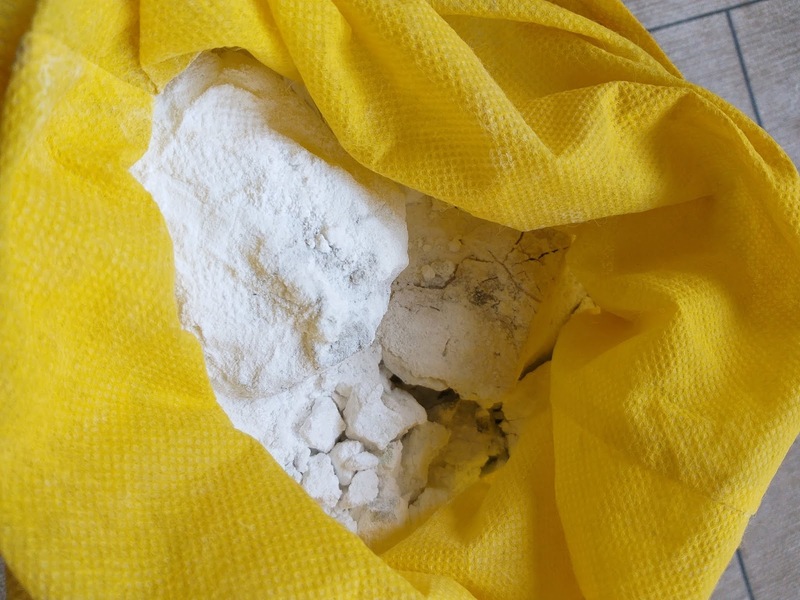 In traditional hand block printing madder was used as a source of natural alizarin to get red dye color where alum is printed but today it is replaced by synthetic alizarin. 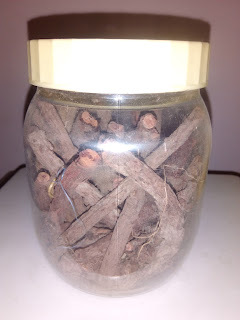 Madder is not just a source of dye but used as a main element in Ayurveda. A tonic called "Mahamanjishthadi Kada" is named after its use in preparing it by mixing other herbs in certain proportion. This tonic is very useful and recommended by physicians for blood purification. It is having skin healing property too. People who are suffering from skin irritation or any other skin related problem madder dyed fabrics may work as a healer for them. Madder is very useful natural herbal dye which does not contaminate the water resources and works as a skin healer too. For a healthy skin madder dyed fabrics is a good choice. 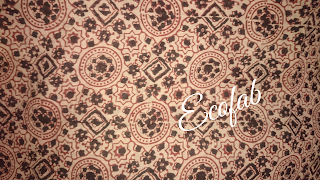 Ecofab has started working with madder roots since its inception to over dye traditional hand block print fabrics and sarees with it to get hues of pink and red. While working with craftsman came to know that today they are using synthetic alizarin in place of natural source of alizarin to get red color in place of alum print. 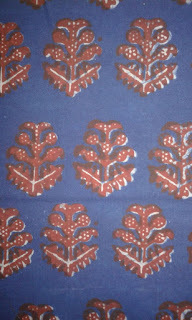 Ecofab started experimentation with madder to dye traditional hand block print fabrics with it but didn't got success initially. Result got as faded red color or no color while dyeing with madder roots. 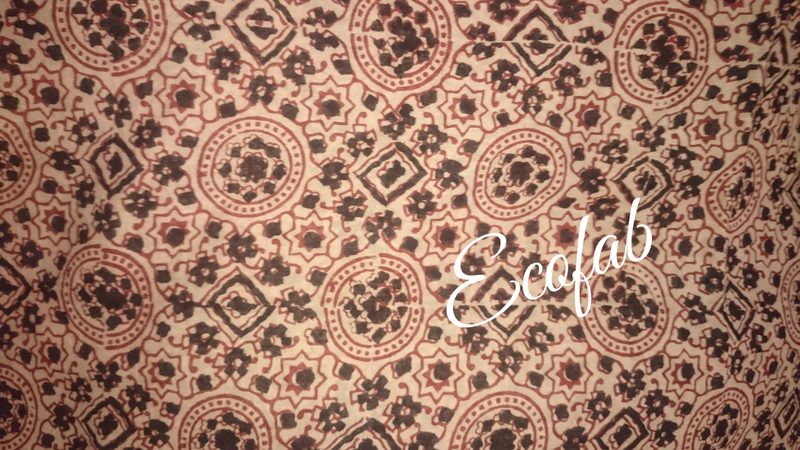 Ecofab continued experimentation and finally got the formula to get shades of red dye, orange and turkey red in place of alum printing in hand block printing. 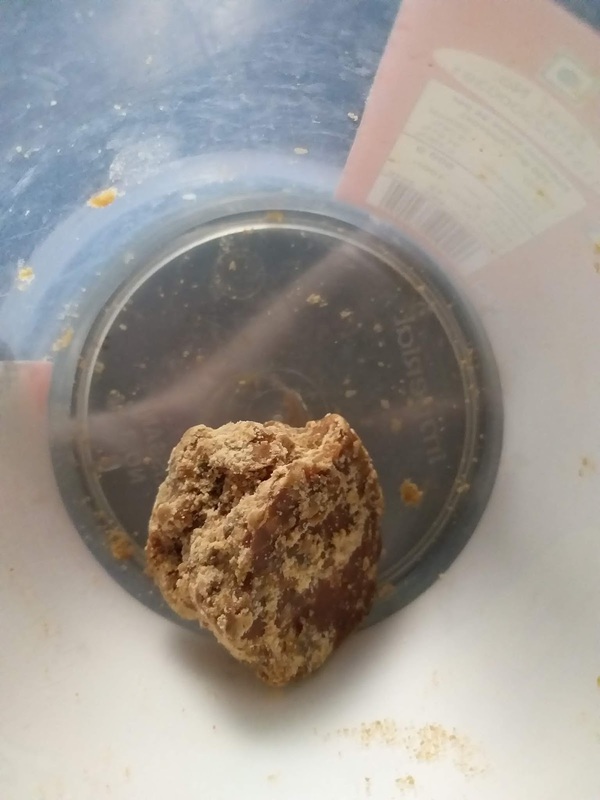 Ecofab created a madder formula to extract red color from madder. 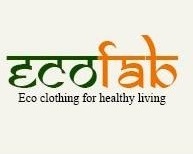 It gave a new dimension to Ecofab's work with traditional hand block print to regain its roots. Now valuable natural red dye is rejuvenated. 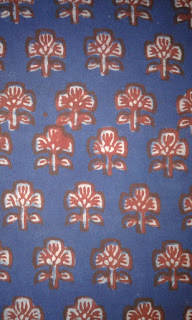 Alzarin printing is one of the most practiced techniques of hand block printing in India. 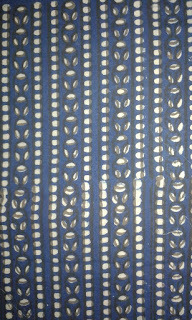 It is a kind of direct mordant based hand block printing technique. 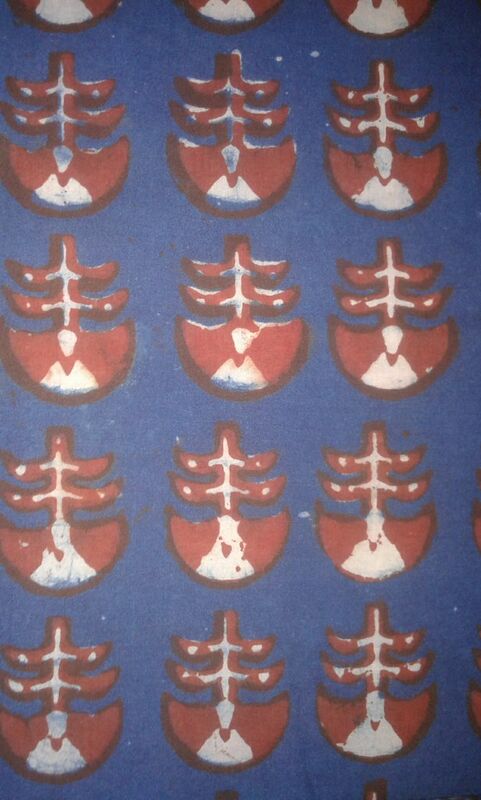 It is known as alizarin print because of use of alizarin as an essential element in the dyeing process. It is also known as syahi (Black) & begar (Alum) work by the traditional craftsman. 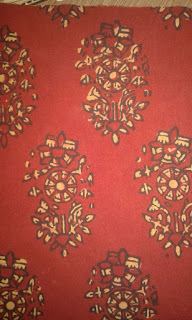 In this block printing technique basically two natural colors available made from natural elements are red and black. To get red color first alum mordant is printed and then dyed with alizarin (Madder or al roots) to get red color but today synthetic alizarin is used in the process due to easy availability and cost factor and black color extracted by fermenting jaggery powder with iron rust. Today in India few famous traditional block printing centers for alizarin printing are Bagh, Bagru and Tarapur. Bagh and Tarapur situated in Madhya Pradesh and Bagru is in Rajasthan. 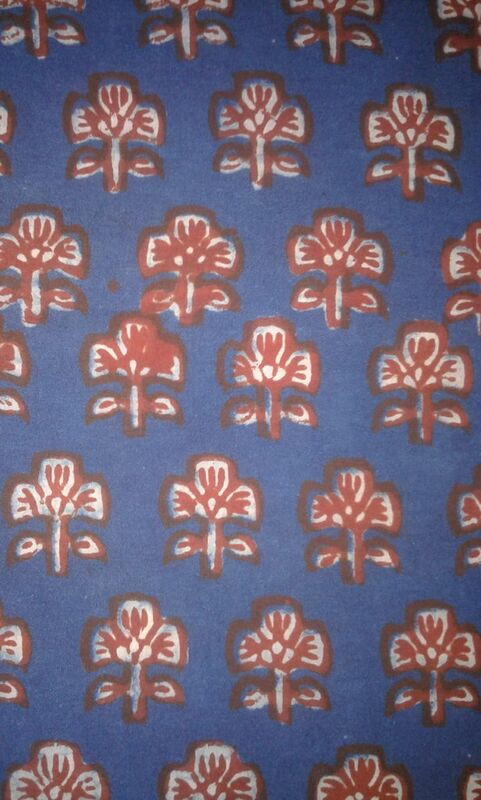 Few decades ago Sanganer, Bhuj, Surat and other centers were also famous for this style of hand block printing but due to market pressure of lowering the prices and limitation of colors in the process most of the centers converted into pigment printing or stopped work. Every area has its own geographical specialty and quite famous for it. Bagh is famous for its vibrant red and Tarapur is famous for its zed black. 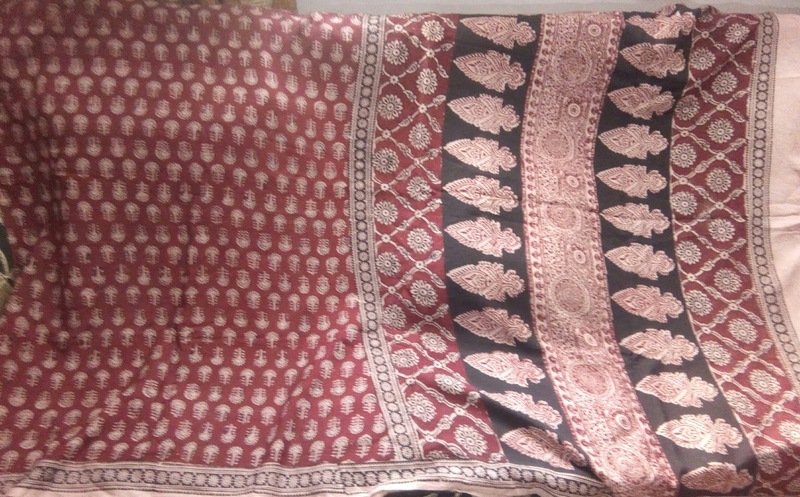 Bagh print is one of the famous form of alizarin hand block printing craft of India, practiced in tribal village “Bagh” situated at the banks of Baghini River in Dhar district of Madhya Pradesh. Minerals found in the Baghini river water gave natural color more vibrancy and increase its fastness. Due to river water printing with alum gives a vibrant red color while dyeing with alizarin. Due to its local specialty it got geographical indicated brand status in the year 2009. Some 400 years ago few families of "Khatri Community" migrated from Sindh province in today’s Pakistan to Manavar and then Bagh. Another theory says few families of "Khatri" community from "Bherogarh" Village near Ujjain migrated to Manavar and then Bagh in search of new market to continue the tradition of hand block printing. National awardee late Ismail Sulemanji Khatri made this art of hand blocks printing famous by experimenting with urban outfits and variety of designs. 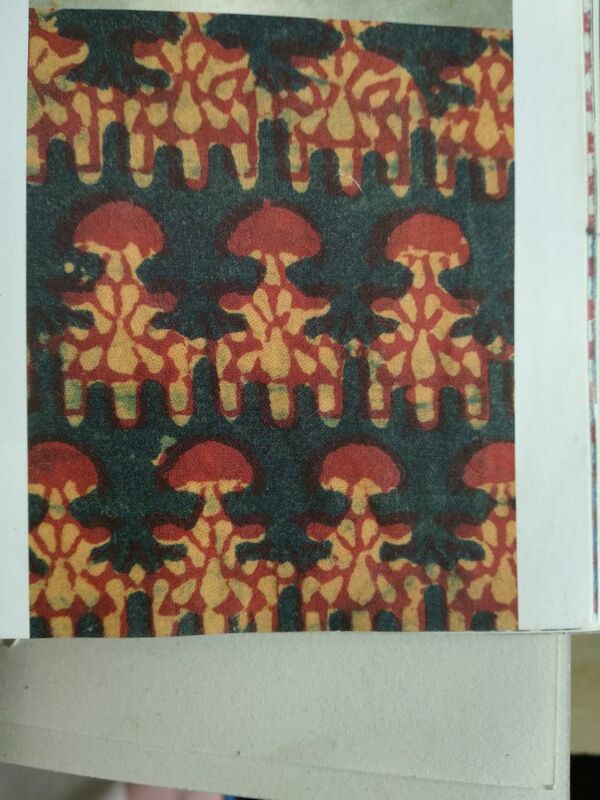 Before 1960 hand block printers from Bagh were known as alizarin printers because of use of alizarin in the process but today they are famous as Bagh printers due to geographical uniqueness associated with the craft. In 2009 it got geographical indication from the government of India. 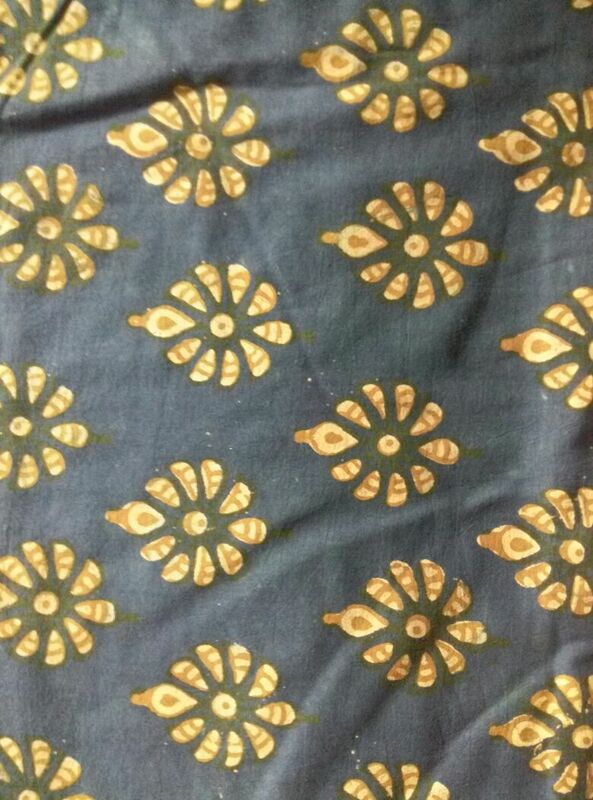 Bagru print is also a famous hand block printing technique done in Bagru village of Rajasthan situated on Jaipur-Ajmer highway 30 kilometers away from Jaipur. Here also alizarin printing is done which got Geographical Indication for its local specialty. Printing is done in off white background. In Bagru alizarin gives a beautiful brick red shade. 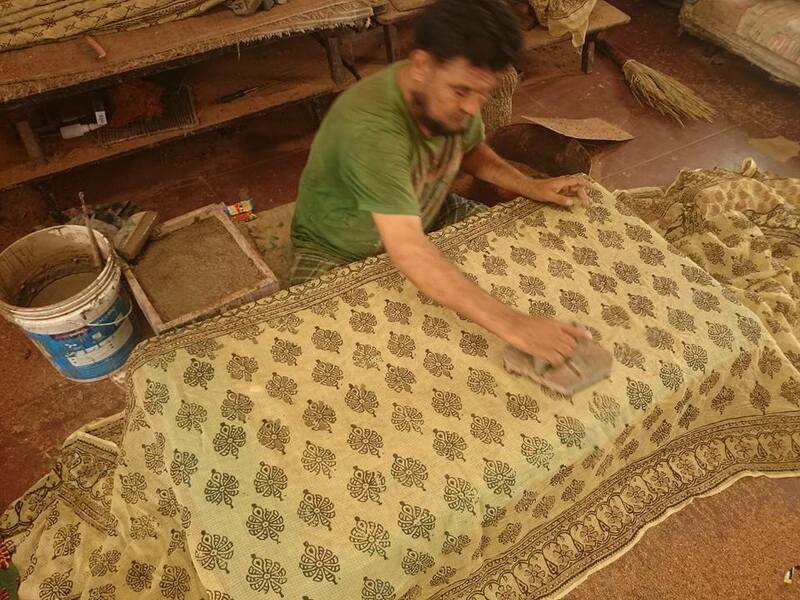 It is one of the oldest hand block printing center in Rajasthan where still traditional hand block printing techniques mainly Dabu printing is practiced along with alizarin hand block print. "Chhippa Community" of Bagru associate themselves with the tradition and lineage of "Sant Namdev" tailor by profession and one of the famous saint of "Bhakti tradition" in India lived during 13th century. 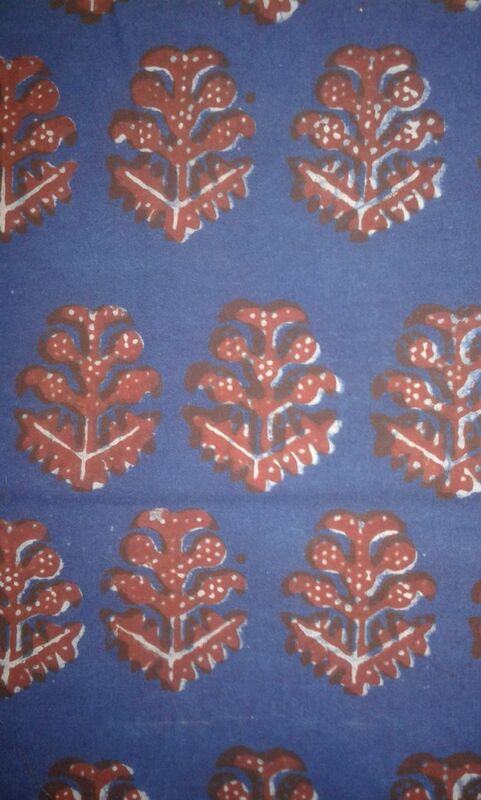 Ummedpura-Tarapur village of Madhya Pradesh alizarin hand block printing is also practiced. They are still using “Kath” (Vegetable black color) using jiggery powder and iron rust instead of “kashish” (Readymade vegetable black color) now commonly used to prepare black color. It is a very small village situated on the banks of “Ghambhiri” river having population of 2500 to 3000. Tarapur is 270 kilometers away from Indore the industrial capital of Madhya Pradesh. 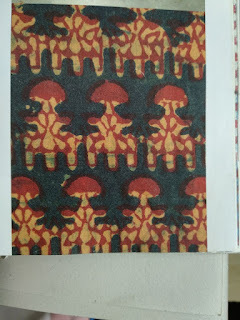 For red color first alum as mordant is printed using tamarind seed powder paste and then dyed with alizarin. Now a day synthetic alizarin is used unlike 50 years ago roots of morinda tinctoria were used. Here alizarin gives beautiful maroon red shade. 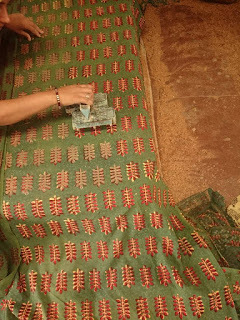 “Chippa” community is practicing the craft of hand block printing in Tarapur since 400 years, who claims to belong to the lineage of Sant Namdev, a famous saint of “Bhakti tradition” in India. 10-15 years back some 30-40 families of “Chippa community” were involved in this craft restricted to the 3-4 families today. It’s all due to tough competition from the chemical screen printing and imitating of designs by machine printers selling it at cheaper prices than hand block printing. 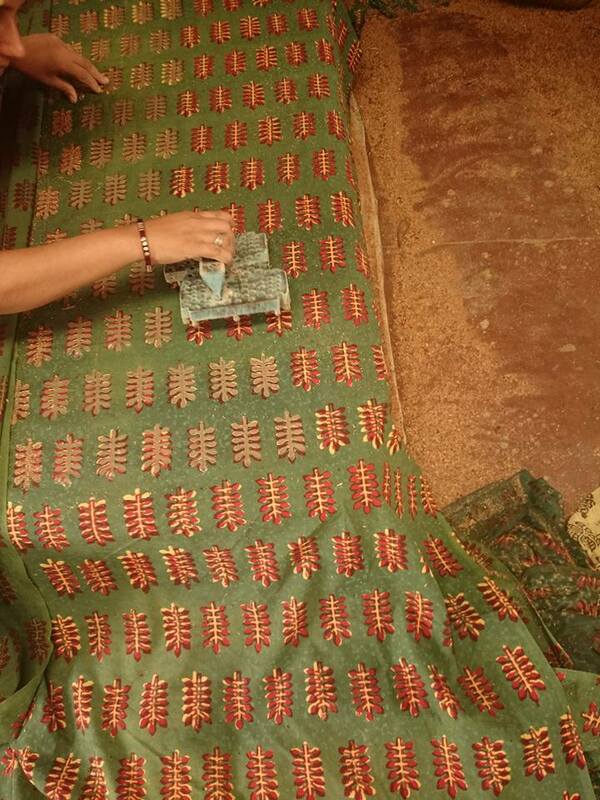 But they are still following the traditional methods in preparing the fabrics using semi-vegetable colors. 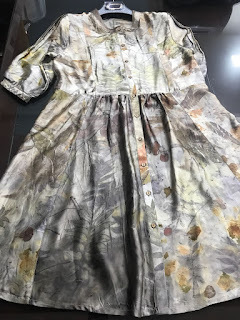 History of natural dyes is very old, when there were no use of chemical dyes in practice, because human being was very close to nature and dependent on natural resources only. After industrial revolution and advent of synthetic dyes use of natural dyes started falling. Reasons behind use of chemical dye was easy to use and bright colors. Today when world is facing a problem of scarcity of water resources, contamination of existing water resources. In this problem situation use of chemical dyes contributing the most. It is not only contaminating the water resources but also hazardous for human skin and health. To address the solution to the problem we need to go back to the nature. But very few people were engaged and still practicing the art of natural dyeing and continuing the tradition. Continuing the traditional art of natural dyeing one of the master dyer and designer from Australia India Flint innovated a craft of "Eco-dyeing" and "Eco Printing" using 100% natural dye ingredients to beautify fabric. 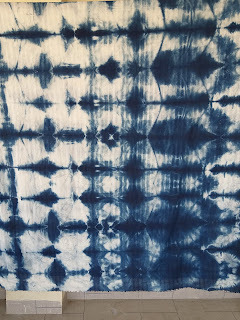 Today eco printing is an art further developed and popularized by various master dyers and designers like India Flint, Irit and Omila Bir to name a few. Omila Bir a health professional is continuing this art as a passion and to express her creativity. Eco-printing requires a huge skill, arduous efforts and lots of practice to get the desired result. 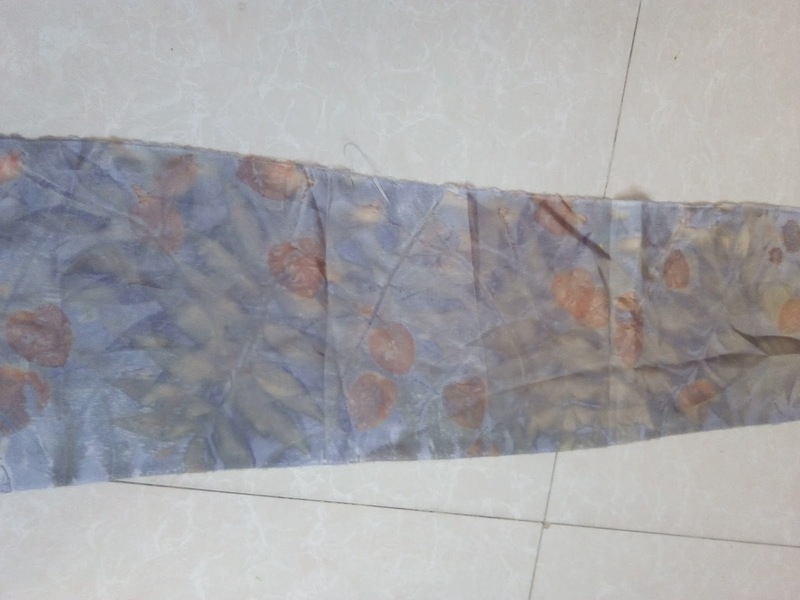 Eco printing is an art of printing leaves of various plants by wrapping it under the fabric and dye it with chosen natural dye to get the desired shade and leaf design on the fabric. It is completely a natural process to print and dye the fabric in a complete organic way. Most of the dyers are now started growing desired plants and trees to make it more sustainable, eco-friendly and responsible way of dyeing fabrics. Eco printing is getting popular among eco-conscious customers in Europe and US very rapidly and slowly growing its attention in India too. Omila Bir is one of such artists who is popularizing this craft in India. She is working on contemporary and traditional clothing for Indian market. She is one of the first ecoprinter who has done ecoprinting on Indian traditional wearing such as Saree which requires an extra effort because other master ecoprinters can't print more than 3 to 4 meter fabric on contrary to which Omila is doing it on more than 6 meter fabric. Omila Bir recently collaborated with EcoFab to market her fabulous collection of Sarees, fabrics and stoles. During my Ph.D. thesis work visited Balotra some two and a half years ago. A town 450 kilometers away from Jaipur in Rajasthan well connected with railway track. Balotra is a town of Barmer district in Rajasthan now a days famous for its cotton and textile manufacturing industry was once famous for its unique style of hand block printing now known as balotra hand block printing. 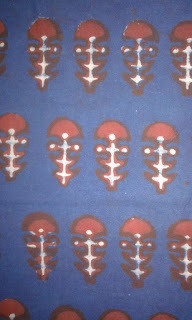 It was once an important center of hand block printing providing printed fabrics to different sections of the society. 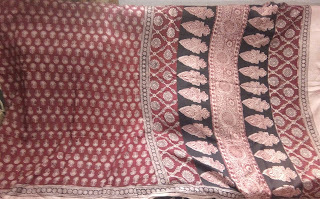 Mainly rabari, maldari and lohar community get identified with their attire having fixed pattern of designing in balotra hand block printing. It is the second largest populated urban area of Barmer district situated on the banks of “Luni” river in which local people saw flood in the year 2002 for the last time. Since then it is dry and no water is there in the river. Once many families mainly Muslim & Hindu “Chhippa” community were involved in the complex style of hand block printing but today only one “chhippa” family of Yaseen Chhippa is involved in the craft of balotra hand block printing. Today his son Akbar is helping his father and continuing this unique craft. Yaseen Chhippa received national award for his commendable work. 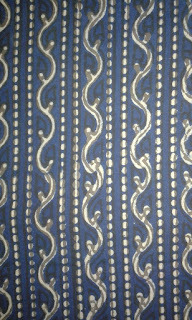 The pattern and style of Balotra hand block printing is very complex yet beautiful and unique. 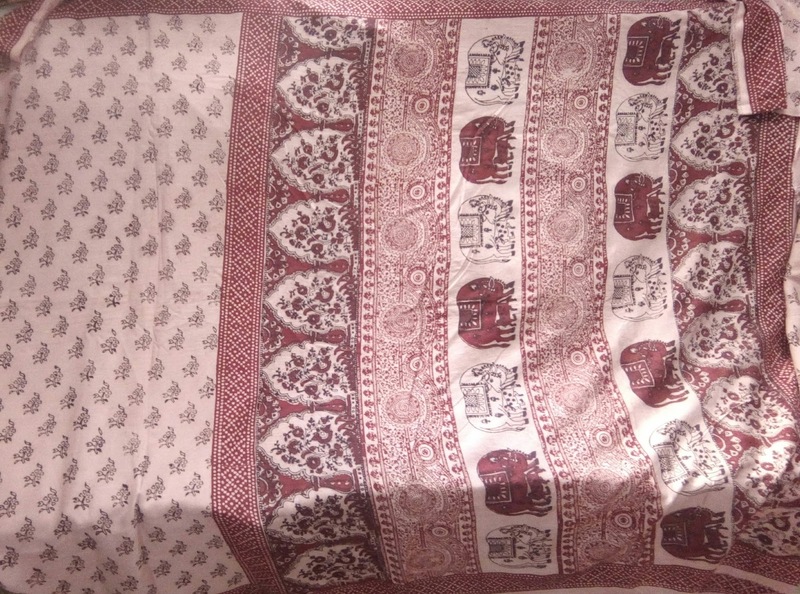 It showcases the beautiful nature and culture in its designs and in process it is similar to nandana and tarapur hand block printing techniques. 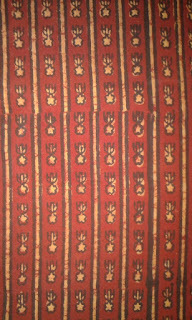 Like Tarapur style of hand block printing Balotra hand block printing is also a complex technique which is a combination of direct mordant and dabu resist technique using alizarin, iron rust, kashish, indigo and mix of pomegranate peel and turmeric (haldi) dyes. 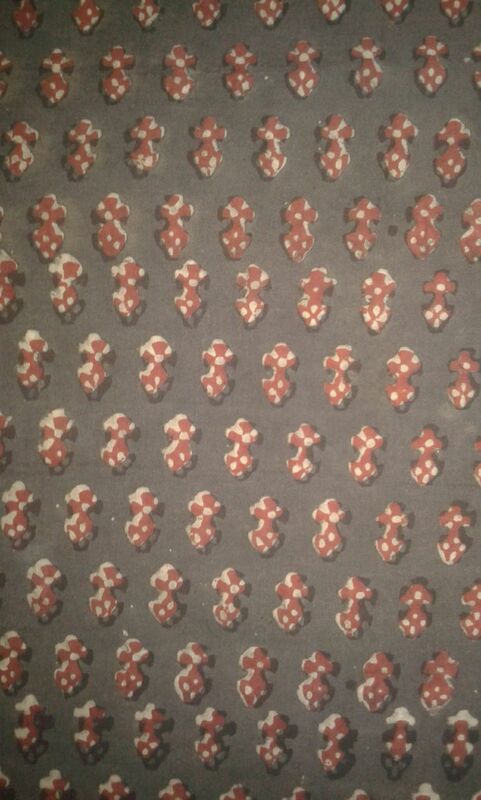 “Anokhi” beautifully documented 20 different motifs in designing used by local printers inspired from nature. “Anokhi” has published a book “Balotra the complex language of print”, describing the significance of different patterns and motifs. 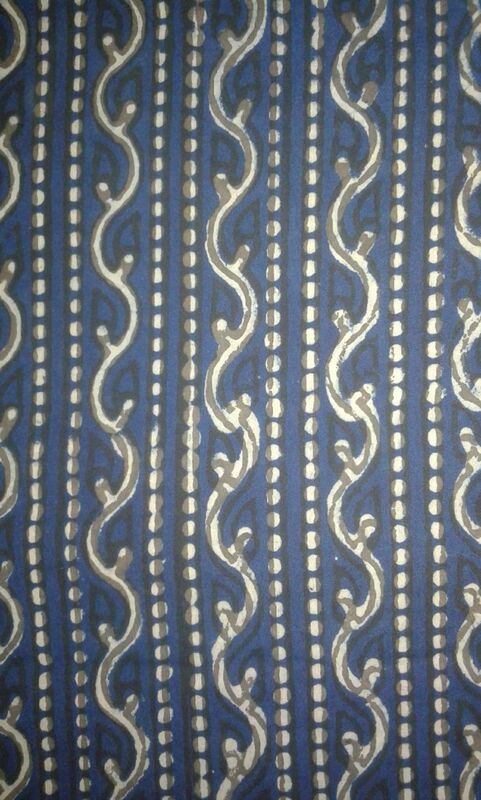 Balotra style of hand block printing and process is very similar to complex craft of Nanadna and Tarapur printing. Yet both have difference of geographical specialties. In Balotra hand block printing traditionally fadat and Ghaghara fabrics were made for local women while in Tarapur “Nandana” ghaghra and “Jawariya” lugda were made. Today one family is left in this work mainly produces running material, stoles, dupattas and sometimes bed sheets. 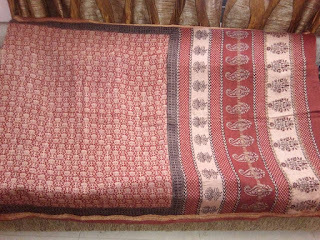 They seldom do sarees as it is not very easy for them to do it with such a complex style of hand block printing.